“Next week, The Railway Man, a film based on a true story, will be released. It tells the tragic story of a British PoW tortured by the Japanese in the Second World War. The film is not only about the atrocities committed by his Japanese captors, but also how one of them is harrowed by his own past. His redemption is only effected through deep remorse and penitence”. That British PoW’s name was Eric Lomax, and he died not long ago during the filming of his story. Eric’s story became more widely known following his dramatic reconciliation with the Japanese soldier who tortured him in Thailand, Nagase Takashi. Through this reconciliation he said he ‘found some kind of peace and resolution‘. When Eric’s wife accompanied him back to the graves of British PoWs who died in the war, she asked if reconciliation with Nagase might be some kind of betrayal. He did not see it that way, replying to her “Patti, some time the hating has to stop”. Finally Patti had those words written on her husband’s grave. “Some time, the hating has to stop” is is a sentiment notably absent from China and Japan’s latest efforts at public diplomacy. I draw two conclusions from this: (1) This suggests the link China is making between Japan’s wartime aggression and the present disputes is most probably disingenuous, and therefore offensive to the memories of men like Eric Lomax; and (2) Japan is neglecting its history of reconciliation (stories like Takashi’s) as a source of soft power. In his letter, China’s Ambassador Liu seemed only interested in one aspect of the Lomax/Takashi story, which was the aggression, then remorse and penitence of the Japanese soldier. The importance of forgiveness (by Lomax) perhaps not serving his purpose. Contrary to what seems like an attempt to inspire the British to see China’s side of the argument over Japanese militarism, Amb. Liu inadvertently highlighted the quintessential case of Anglo-Japanese post-war reconciliation. It is a story, in all its aspects, that Amb. Hayashi would do well to consider, along with his commitment to ‘squarely face’ this history, especially in his response to Amb. Liu. Perhaps because he felt all this was merely a ruse, he chose instead to base his latest defence more on a legal argument. He may succeed in this, but Japan should not disregard the power of such stories to form public opinion and inform policy. Like Takashi Nagase, Japanese leaders have apologised so are present generations not ready to be forgiven? Since China has noted Eric Lomax’s story, can it learn a lesson from him as well? Amb. Liu said in a BBC interview subsequent to his letter that the reason China cannot talk to Japan about its territorial disputes is because PM Abe visited Yasukuni shrine. A relationship between post-war remorse and contemporary power politics continues to be held against Japan. But Japan has a strong case on both counts, and if this link continues to be sustained the significance of successful Anglo-Japan reconciliation should not be overlooked. 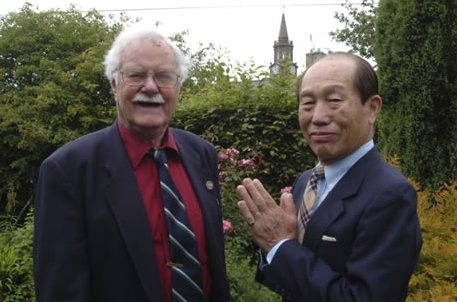 Lomax and Takashi in later years.